After saying goodbye to Bizarro World, we headed north up Ecuador’s coast to a surfer town called Montanita. After so much rain in Colombia, we were ready for some beach action…but not so fast. We arrived to overcast skies and more drizzle. No matter! We’re at the beach, right!? This is where we were to settle down for one month so Dusty could get his work on. After the 3.5 hour bus ride, we were welcomed by a young boy about 15 years old. Since we arrived without a place to stay, we allowed him to show us some potential hostels. He took us to one hostel that smelled like mold and had a bunch of sawdust everywhere because of construction going on right outside the balcony. 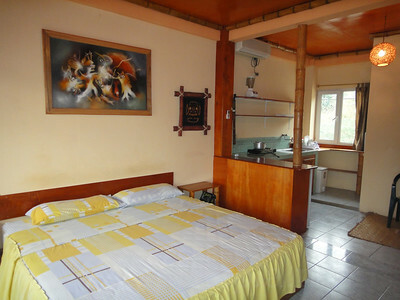 After refusing this room and several others, he showed us a newer hostel directly on the beach called Abad. I don’t think it had been open long as they were still building a suite on the top floor. After approving of the room we asked the hostel owner how much it would cost. Her answer of $25 per person made my eyes pop. Luckily, the boy had our back and corrected her by saying, “No! $25 para dos.” The lady agreed this was fair, ha! So, here we were beach side with a view of the ocean and surfers for $25 a night! After settling in, we started to look into where we could set up shop for the entire month. We needed a kitchen for me and wifi for Dust which was proving to be difficult since Montanita is not set up this way. 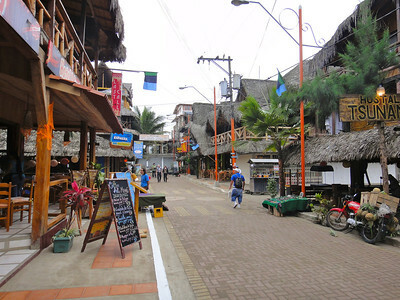 Montanita is a tourist town full of hostels and restaurants. Every building is a hostel with a restaurant or store on the ground floor. It’s set up for surfers and partiers, not gringos trying to whip out their laptops and concentrate. Just look at it…every block looks like this. After day two of searching, we were able to find a house a few miles down the road with potentially crappy internet and a bit out of our price range. 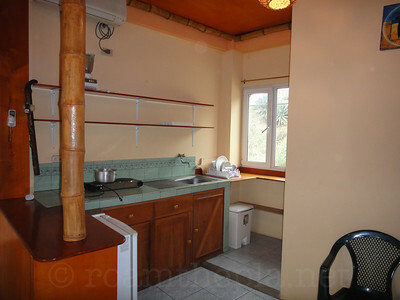 Another option we affectionately named “kitchen”, was Hostel Machu Picchu which had a suite with a kitchen and wifi. The catch was that “feriada” was approaching which is 4 days of parties to celebrate Halloween, Day of the Dead and Cuenca Independence Day. 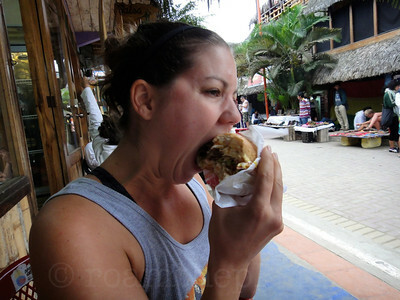 The Ecuadorians flock to the coast for this. Needless to say, prices were gonna rise on every room in town. Our beach side hotel was rising to $35 per person. “Kitchen” would allow us to stay for $500 for the month PLUS $50 night during feriada. With few options we, gave in and moved into “kitchen” to save $20/night and to get settled for the month. Feriada began and so we sat back and enjoyed ourselves, finally able to relax after committing to our new home. Feriada was nuts. People sleeping in cars, discos going until 6 in the morning and more venders which was great for us. We ate like champs! 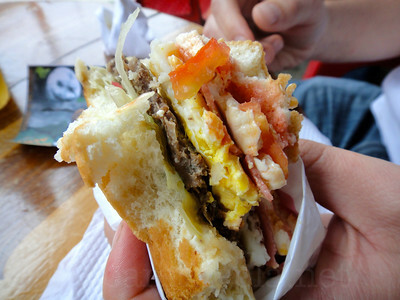 You can’t beat a cheeseburger with ham, fried egg, lettuce, tomato, onion, salsa and guacamole for $2 and 20 oz. Pilseners for $1! With feriada going on, we thought we might as well enjoy it until it’s over. Lots of time was spent watching the people, eating, drinking and playing cards. Unfortunately, something just wasn’t feeling right about our accommodations. “Kitchen”, which was starting to be termed as “kitchen nightmare”, kept popping in and out of our conversations. It’s not like the place was awful….just not the beachside living we had been dreaming about. Not only was “kitchen nightmare” not very cool, we started feel like we were cheated. During our attempt to negotiate, the guy wouldn’t budge an inch on the price. The thought of spending $200 on just 4 days and then $500 for an entire month was eating at us. At one point Dusty says, “I think it’s just that I feel like we lost (the negotiation).” That was enough. We finally decided to look into another town that was much bigger just one hour south. Feriada was still in full force on the morning of our fifth day. On our way to breakfast, we had the pleasure of witnessing those still partying from the night before. One such partier had his pants down, in the middle of the street, relieving himself while still holding his beer. Hola Ola, our favorite restaurant due to being one of two places in town with wifi, brought much relief when we received a response from Amy in Salinas. She had an American style condo for us and could meet in a couple of hours. Woohoo! We headed back to “kitchen nightmare”, packed up and jumped on a bus. We really liked Montanita, it was a cute town with much partying to offer. A months worth was just too much for these gringos. November 10th, 2010 Guaya Not? November 7th, 2010 How can you afford to travel?